To achieve the pinnacle of success in the virtual football world, one must build a team with really good players and a bit of video game smarts. The New England Patriots and Atlanta Falcons took separate paths to take part in one of the most memorable Super Bowls of all time, but they both fit the mold of success. The Patriots have been at the top of the football world for the last decade and a half. They’ve built a consistent winner. The Falcons, meanwhile, have took some time to get to their first Super Bowl since 1999. The Patriots have had the same general structure for many years while the Falcons have had to tweak their plans during the same span. But the point is if you’re in the middle of a franchise and trying to win a Super Bowl, you’re going to need a plan. These two teams came up with a plan, and you can execute a plan if you have the right mindset in Madden. Just like these teams need Tom Brady and Matt Ryan, you need a signal caller. A good one. And if you’re lucky enough to develop quarterbacks like these two, you’re almost guaranteed to be in contention right away. Ryan’s ratings have leaped since the start of the year. Going into the Super Bowl, the Falcons’ franchise quarterback possessed ratings of 94 throw power, 98 short accuracy, 94 medium accuracy and 88 deep accuracy. Oh, and he has 73 speed and an 89 rating when throwing on the run, so feel free to escape the pocket when needed. Don’t forget Brady, either. Despite playing in only 12 regular season games, the four-time Super Bowl MVP posted a similar 95 overall to Ryan, but had a slight advantage in throw ratings. He still has the stellar throw power at 95, followed with a 99 short accuracy, 97 medium and 87 deep. Brady even has an 85 throw on the run, but at his age and 60 speed, don’t go mental and do that. These ratings are scary good, especially for Brady. 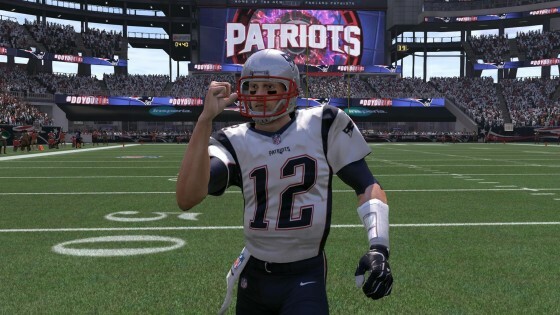 For a game predicated on affecting ratings as players get older, Brady is still the cream of the crop. Ryan hasn’t been this desired of a quarterback since 2013, and this is by far his best year ever. 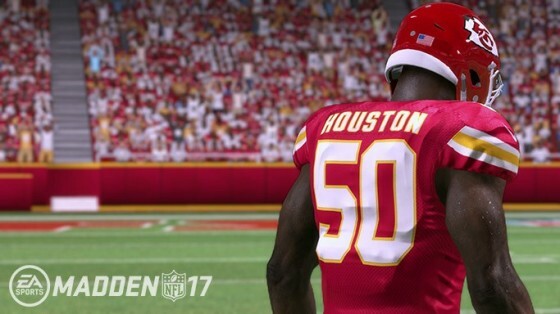 His Madden stock has never been higher, and these ratings are a testament to that. Point being, your goal should not be to replicate the 2000 Baltimore Ravens by playing Trent Dilfer every week. Getting someone with near-perfect throw ratings is a good start. Make sure he has a hint of speed to get away from some of these quick pass rushers. You can do this the harder by drafting one and developing him. Or, you can play as the Dallas Cowboys and turn Dak Prescott into a superstar. I won’t judge. Ryan has a 98 overall wide receiver to throw to. In real life, Jones’ rating is probably a 298 because the things Jones does shouldn’t be legal. Not many receivers, even in Madden, should be 6-foot-3 and possess 94 speed, 95 agility and 97 catch to go with 96 route running. How in the world do you even stop that? Not even a double team helps that most of the time. Jones has the speed to take the top off the defense (that 98 beat press rating helps a lot) and the height to leap over any defensive back in the area (thank goodness for a 97 spectacular catch, right?). And, oh yeah, he has a 96 jump, as well. But sometimes the receiver isn’t the only playmaker. In the case of the Patriots, Rob Gronkowski does things a receiver can do — only he’s much bigger and probably scares every breathing soul covering him over the middle. Having the star quarterback is one thing. Having someone like a Julio or Gronk catching those passes is another animal entirely. The position doesn’t matter, just the skill. This is a perfect segue to the Patriots and how they got it done on Sunday. You’ll need some solid depth behind your stars (James White! ), and both teams possess that. New England had gotten outstanding contributions from Martellus Bennett leading into the Super Bowl, and he was solid yet again on Sunday. Bennett leapfrogged to an 89 overall rating with 89 catching and 80 route running. His 6-foot-6 frame gives him that Gronk-like factor in the vertical game, which does wonders for his 85 spectacular catch. He’s not as fast as Gronk (Marty B. has a 78 speed), but Brady is fortunate to have other weapons in the passing game to open up the field. Julian Edelman is New England’s top wide receiver, but has attributes tailored more to being a slot threat. The 86 speed isn’t alarming, but he’s quick with 91 agility, 88 elusiveness and can catch a lot of passes with that 90 catch rating. 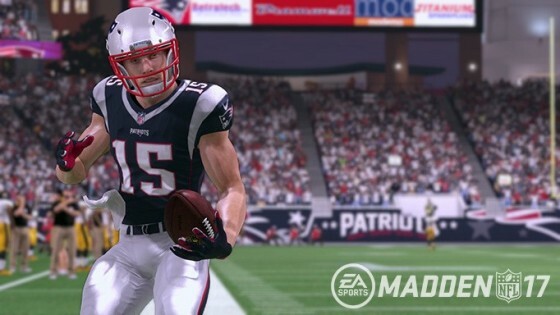 Then there’s Chris Hogan, who is now an 82 overall with 88 speed. He even has the best hands on the team with 92 catching after his three-touchdown day in the AFC Championship. And buried down at No. 5 on the depth chart is Michael Floyd — the tallest receiver on the roster, capable of making absurd catches in Madden. The names don’t jump off the page, but Brady makes them better. Give a good quarterback some depth and see what damage you can do. The same goes for the Falcons. Behind Julio stands Mohamed Sanu, a perfect Roddy White replacement; and Taylor Gabriel, who may emerge as one of the best slot receivers in football. 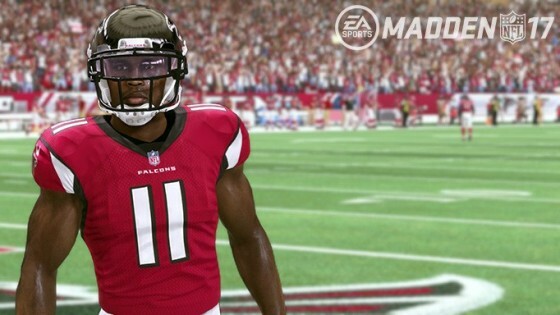 Sanu is 6-foot-2 with 88 speed and 89 catching. He’s also a four-year pro, so that ceiling is going to get higher (much like that 90 spectacular catch, am I right?). Gabriel is fast, quick and can catch. That 93 speed/86 catch combo coming out of the slot, and only as a two-year pro, is salivating (ENDLESS DROOLING). Depending on your offense, one of these styles is possibly the perfect mold for you. Having an abundance of route runners sounds appealing, but so does having speed and guys who can jump over anybody. Depth is key, whether a star is hurt or another star is commanding a lot of attention. This plan has no substance if you’re building like the Patriots because I’m sure New England doesn’t even have a clue what they do half the time with its defensive personnel. They traded Jamie Collins and the Patriots are still a collection of football cyborgs that do no wrong most of the time. The reason being is the work the Patriots do in the secondary. Malcolm Butler has gone from unknown Super Bowl hero to a 91 overall with 90 man coverage and 93 zone coverage. His press may be standard at 83, but Butler can still snag interceptions in this game like he’s the second coming of Darrelle Revis. Logan Ryan can also hold his own with 84 man coverage and 87 zone. Sometimes, having good corners is more than enough to offset a lack of a pass rush. Unfortunately, Chris Long at 78 overall isn’t enough to get constant pressure in Madden. The Falcons don’t have the star power on defense…yet. There’s so much youth on this squad, it’s scary, and they’re led by the league’s sack leader Vic Beasley. Not many 82-overall players at 24 years old can command a 91 finesse move rating and record double-digit sacks while playing outside linebacker in a 4-3 base defense. Dan Quinn’s defense is so schematically perfect for Beasley that he moves to defensive end in nickel packages, and his overall goes up to an 84. That’s just unfair. Atlanta’s secondary may in time become the second coming of the Legion of Boom. Jalen Collins, the Falcons’ second-round pick last year, has bumped up to an 85 man coverage corner in his second season with 90 speed. Robert Alford is more tailored to be a slot corner with his 93 speed, but his 81 man coverage is the best Atlanta can do. He’s also just a three-year pro so he’ll probably get better. And we need to talk about Keanu Neal, the first-round pick in the 2016 NFL Draft. He’s an 83 overall with 87 speed, 78 pursuit and 87 zone coverage. He’s a dang rookie. Come on, now. The Falcons’ approach is to build defense through the draft, and that seems to be working. That also goes to show that might not be the worst route if you’re trying to build a contender from the ground up. You’re one good draft pick from snagging a Beasley or Neal in the early-to-mid first round. If that’s your plan, stick with it and don’t deter from it.